Transformation has arrived in the heartland. While slick, mainstream dance music that's all about the party and excess rules the airwaves, deeper, richer, spiritual events have long blossomed in underground pockets around the world and on the coasts in this country, and now new showcases are cropping up in new and exciting markets, and the sounds of healing are spreading. 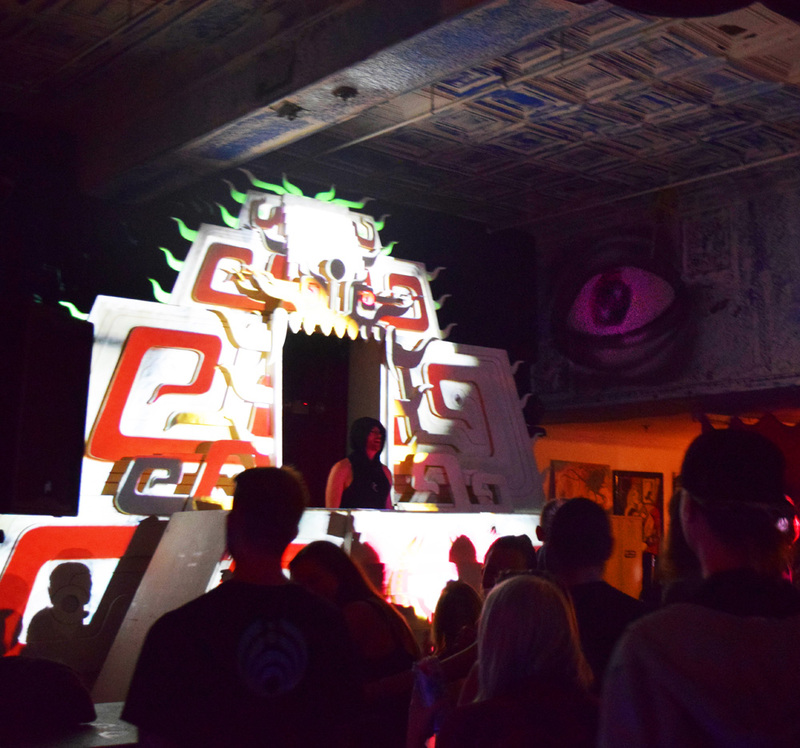 St. Louis, Missouri's newest monthly, Temple, is bringing that fusion of sonic exploration, psychedelia, yoga, art, and connectedness to a part of the country that has long been ruled by commercial EDM. Breaking the cycle and fueling the city's vibrant arts' scene with a totally new approach to show promotion, the team behind Connector Presents is doing something different. Two Temple projects merged for a creative and conscious evening in early November at 2720 Cherokee in St. Louis. A food drive was being held at the door to benefit the St. Louis Food Bank. Upon entering, a group binaural beat brain wave meditation was being held. This is what I found out about the exercise: Through simple breath and sound you can be transported to a state of deep relaxation where healing may occur. Simple pranayama breath work, in combination with advanced brainwave entrainment, leads your mind to a border of the alpha and theta brainwave states around 8 Hz (Schumann resonances a.k.a. Earth's heartbeat). The quick pulsed isochronic tones backed by ambient music has been clinically tested to increase serotonin uptake. The breath work synchronizes brain hemispheres. This, along with music, can create a profoundly deep state of relaxation and rejuvenation. In this state your brain is capable of processing much more information allowing for healing work and emotional release among improved concentration and ability visualize and empathize as well. The energy was alive as I walked into the midst of this progressive exercise. An earth altar had been constructed, to which attendees added their various offerings of trinkets, crystals, and other natural artifacts. Live painters were turning blank canvases into kaleidoscopic masterpieces in another area. 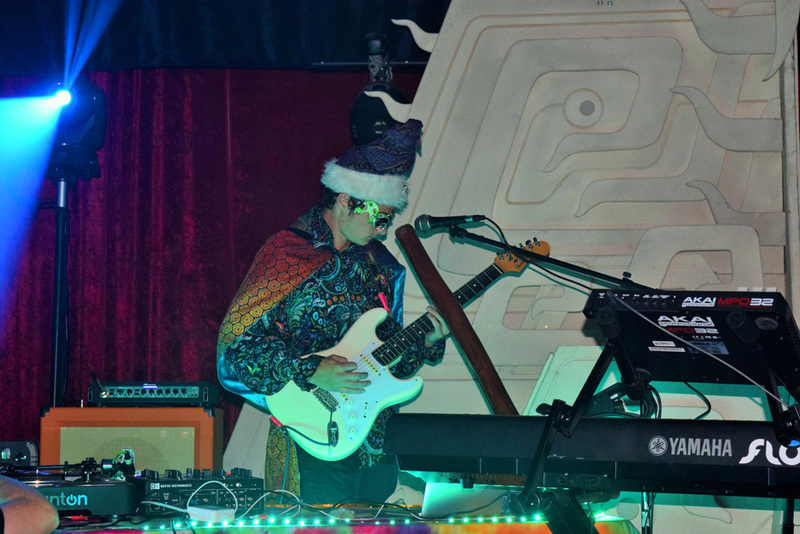 The evening was kicked off by Lusid, a multi-instrumentalist who specializes in psychedelic, funk, and experimental music. Denver duo and Untz Festival artists Bass Physics commanded the stage next, with soulful bass and live guitar and keys. 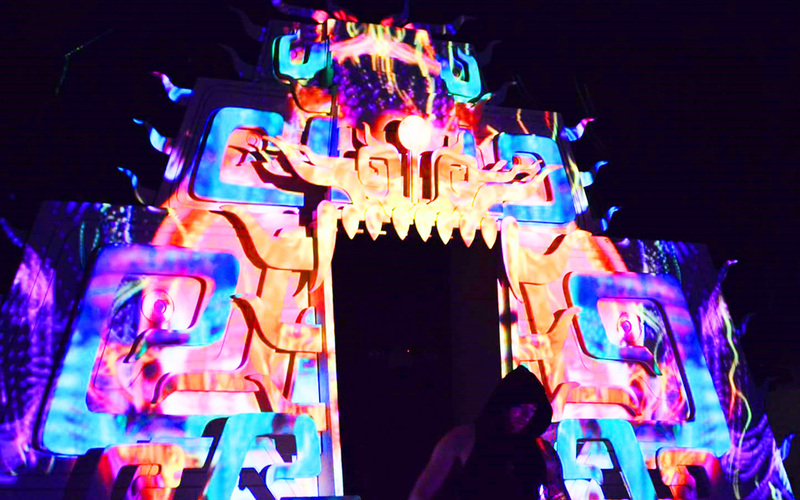 Phutureprimitive took over as the headliner, and his deep, luscious beats reverberated off of the walls of the venue gallery, as the massive temple structure lit up and began to pulsate with vibrant video mapping. Phutureprimitive, moniker of Portland based musician Rain, has described his music as “dripping wet love drops of nasty mind melting sonic bliss.” You could say this is a fairly accurate description. Making his way to St. Louis as part of his Searching for Beauty in the Darkest Places Pt II Tour, Phutureprimitive left a mark on this Temple event. The artist played piano from a young age. He was later drawn to electronic music, inspired by its ability to combine the best of organically played instruments and synthetic pleasures of sounds more exotic to the human ear. 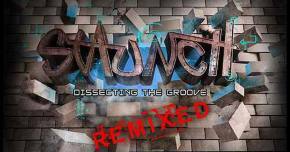 He began his DJ career in the 90’s, slowly incorporating music he made in his home studio into his sets. This blossomed into a full-blown love affair with electronic music and the process of its creation. 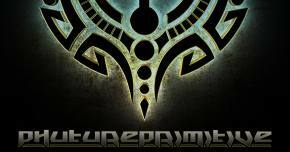 Phutureprimitive was born. His performance was psychedelic in nature, yet melodic and precise in execution and delivery. Divine downtempo. There was definitely a distinct rejuvenating feeling throughout his set. My senses were heightened and a strong feeling of connection to the other people around me left resonating healing vibes. The Temple concept event is thrown monthly by 2720, and has begun to cultivate a community of like-minded individuals that have a desire for a deeper, co-creative atmosphere in which to experience music. The evening moved me and reminded me of events I’ve attended in the western part of the country, where this higher consciousness community is growing. It’s beautiful to see 2720 bringing this much-needed vibe to the Midwest. Music industry veteran Eric Noble opened up to me about these events and his story. Cassie Pope, a lead oranizer and Noble’s partner, provided some wisdom as well. Ellie Salrin: What inspired you to create Temple events? Eric Noble: Temple was a divine message straight from the ether. About a year ago I had an "experience" while sitting shotgun with long time friend Spankalicious. He was driving our intergalactic spaceship along desert highways from San Diego heading back to St. Louis. At the start of the experience I remember Spanky saying "You ate the whole thing? They told us definitely do not eat the whole thing"....I knew then all I could do was accept whatever was coming and hold on! As we drove through Phoenix, or maybe it was Mars, listening to Kalya Scintilla’s Ecstatic Dance mix, everything peaked. My eyes opened wide and I was running and playing with ancient beings. I was shown a vision of my role to the community to provide events with more substance, an appreciation for consciousness, and to provide education to fellow Earthlings as to our responsibility as global citizens. I was pulled aside and shown a vision of a love coming my way - the likes of which would be something I had never experienced in this lifetime. In the moment, I felt I was moving through space and time at the speed of light. It felt like I was mainlining a new truth to my being, downloading a new operating system, so to speak. Ego death is an interesting time in one's life. ...at Gallup, NM, I felt I had enough to process and decided to just get out of the vehicle. I stayed the night in the Mae West room at a hotel on historic Route 66. The next morning, I caught a train the rest of the way back to St. Louis. Trains offer me a special type of solitude where I can think, and I definitely had a lot to think about with everything I was just shown. Within two months Cassie and I were dating and a month later the first Temple show was birthed with Kalya Scintilla headlining. ES: How do you feel these shows are different than others that incorporate electronic / bass music? EN: For starters, the intention is set to honor everyone with love. Temple shows offer free hugs upon entry, the scent of cedar and sage is present, environmental education workshops, fire spinning, an altar where people can bring in personal items to add to the energy of the evening, and an intentions/gratitude board where people can post thoughts they'd like to share. Additionally, every Temple I bring in more subs than I would for a heavy dubstep show. The music and experience needs to awaken souls and I want those who attend to carry the love they receive at Temple back out into the world. ES: How would you describe your personal connection to this type of music as opposed to others? EN: It all goes back to that experience in the desert. The connection is deeply rooted into my being at this point. I love all of my events and I love everyone who supports the shows however it's blatantly obvious the difference in Temple shows compared to other electronic events I promote. Temple is a direct reflection of the divine love I've been gifted with. I see it in Temple shows the same as I see it when I look into Cassie's being. ES: What do you hope people gain from attending Temple events and those similar to it? EN: It's my hope that with the intentions we set at Temple, people leave feeling alive, rejuvenated, happy, more connected to their spirits and community, and more grounded to this Earth. ES: What is your advice for those that are a bit close-minded or apprehensive? EN: Get experienced, there's a paradigm shift happening amongst us right now. These are important times and there's not much time to waste. ES: Are there other artists you wish to host for future Temple events? EN: There's a special hand-picked list I am working from. I'm systematically going down the list and speaking to artists and agents one at a time. We have confirmed Temples with Nominus, Dixon's Violin, Ott, and I've got a few other extra special ones I can't announce yet. 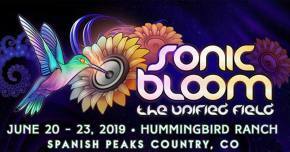 Previous Temples have hosted Kalya Scintilla, Spankalicious, Random Rab, Desert Dwellers, Kaminanda, Phutureprimitive, Bluetech, Plantrae, and PPLPRSN. I'd also like to add that two days prior to leaving San Diego, we were in San Francisco at 1015 Folsom for a Euphonic Conceptions show with Phutureprimitive and Kalya Scintilla. Tonight, exactly one year later, I'm back on a train heading from St. Louis to Kansas City for another Euphonic Conceptions show with Shpongle and Random Rab. I'm meeting Cassie there, we're going to dance and celebrate our love. ES: How did you first become involved in Temple? Cassie Pope: I met Eric through volunteering at 2720 Cherokee, where I have had so many transformative experiences. 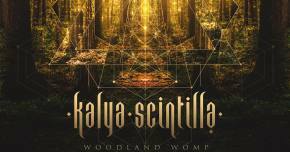 After helping with a few shows, we really connected through Kalya Scintilla's music. I found Open Ancient Eyes through a Facebook post by Eric. The sound, art, and energy of the music stirred something in my being. It reminded me of messages I have received before through dreaming. I feel blessed to have had the opportunity to directly communicate with our planetary consciousness. When I asked for the truth, I was shown the deep connections of life. The truth is that we are all connected in the 'web of being'. We are all beautiful individual cells who make up our Earth organism. The other side of this beautiful truth is that many of us humans have been living in a different way. As we all breathe the same air, drink the same water, and are created of the same biological 'stuff', every act of violence or negligence does damage to the whole. Every act of love ripples out through us all. We are remembering who we are: family. This new level of planetary consciousness seems to be coming through in all forms and directions. We are being called to evolve consciously, and to step into responsibility to our family. As crazy as it seems, surrendering to the flow of music and dancing freely with each other seems to be helping us remember who we are. Eric and I connected through these sounds, the vibrations of love that are coming through. ES: What have you gained from helping put these together? CP: Each time that I get to be a part of these gatherings, I feel better. The moments somehow carry me through. With everything happening in our world, maybe coming together to dance and celebrate is a survival method. 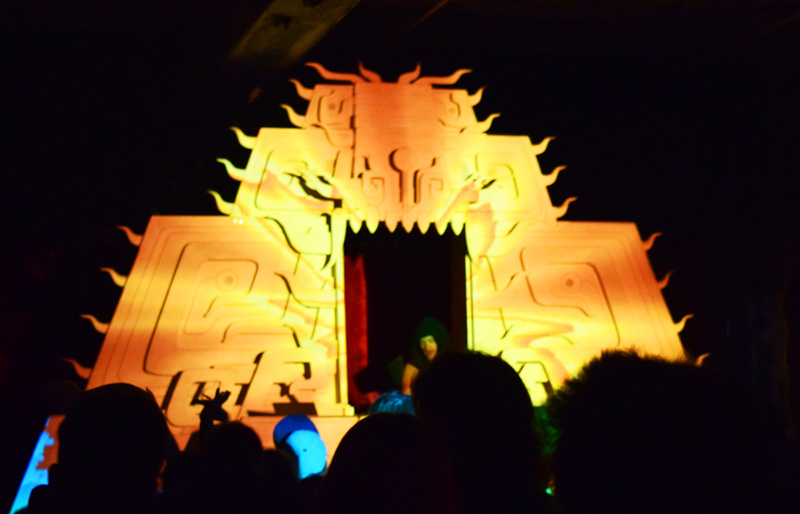 When I got the chance to talk with Alex Grey at Shpongle, he said we were 'coming together in celebration'. The intention with Temple is to create the most loving, positive vibe that we can, in a relaxed, open way. EN: What have you seen others gain from attending? CP: We've gotten a lot of positive response. Many of the people I hear from love the music, the vibe, and the people who come to the shows. To me, the 'sacred bass' music is another level. An evolution of meaning as we learn more about ourselves and the world. This movement as a whole is a sign of a culture that is improving. Our generation, though weathered by technology, war, and excess, is on the cusp of something grand. A renaissance of increasingly artistic and conscious beings. 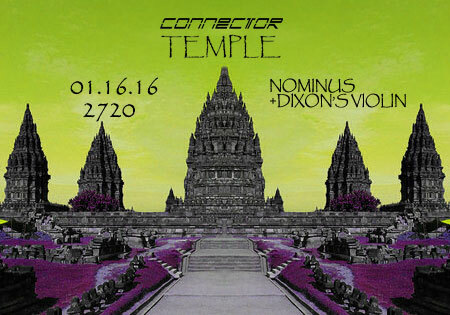 The next Temple event will return to 2720 Cherokee on January 16 with special guests glitch-hop guru Nominus and the innovation expert and speaker Dixon's Violin. You can see Dixon's TEDx talks to get sense of what this transformational artist brings to the stage. It is a fascinating blend of music, motivation, and magic. Catch Phutureprimitive and Bass Physics at the inaugural edition of The Untz Festival. Join us in 2016 at the mouth of Yosemite National Park in northern California for a weekend of music and celebration.